The range operator has some interesting features to do more numbers, and one of them looks like it has some unintended special cases. A couple of months ago, Hauke D reported some strange behavior with the range operator. Some of this is likely to be clarified in the v5.30 documentation but the odd cases remain. One part of this is useful and the others are probably surprising. Don’t depend on this feature for anything that’s important. Even though it acts like this, the undesigned feature may disappear. 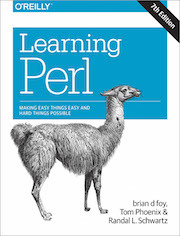 Learning Perl, 7th Edition is now available for pre-order. Amazon.com thinks they’ll have it by the end of September. Now that you can buy the book, I’ll start posting about what’s different in the new edition. We cover up to Perl v5.24, and I think we snuck in one note about v5.26. Wouldn’t it be great if books had embedded videos? That would make programming textbooks so much easier.